Yann Rousselot is a translator, writer, and poet. He grew up in airport lounges and diplomatic enclaves with his brothers, his sister, and countless cheap suitcases, raised across the globe by humanitarian parents. He has been published in Paris Lit Up Magazine, The Bastille, AUP’s Paris/Atlantic Magazine, Thought Catalog, and the Belleville Park Pages. He lives, writes, and performs spoken word poetry in his adoptive city of Paris. 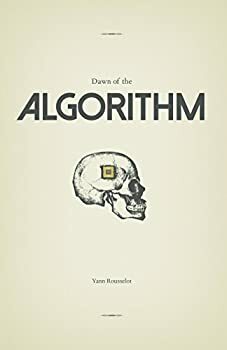 Dawn of the Algorithm is a collection of 33 poems by Yann Rousselot that take a wryly dark look at humanity — mostly our faults — through the lens of science fiction tropes, most pulled from pop culture. We’ve got AIs, giant monsters, depressed T-Rex’s, aliens, and loads of references to anime, science fiction films and fiction. It’s a collection that should have been right up my alley, but though it has its moments, I just didn’t connect with much of it, wanting perhaps a bit more poetry (or at least, my type of poetry, such a thing being so subjective) with my sci-fi.